Channel List: List of available channels. Resolution: Automatically displays the record resolution for each connected camera. FPS: Select how many frames-per-second will be recorded. Higher frames-per-second will take up more hard drive space but will provide a smoother picture. Encode: Select between CBR (Constant Bit Rate) and VBR (Variable Bit Rate) audio encoding. VBR is the default. Quality: Select between 7 levels of video quality. The default is “higher” quality. Lower settings will use less storage space while reducing image quality. Max Bitrate: Select the maximum bit rate to be transferred from the camera to the DVR. A higher bitrate will result in a higher quality recording at the expense of storage space. Adjust: Change the transmission method of the video. 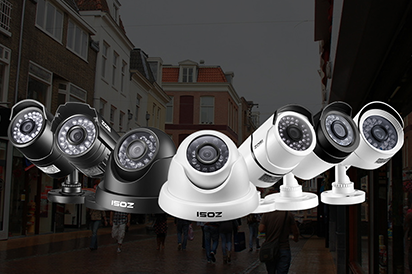 This will alter the High Defintion video feed that is transmitted between your Zosi Camera and Zosi DVR. This will affect resolution and FPS options. Choose between TVI, CVI, AHD, and D1 formats. Recommended for Advanced Users only. To apply your selections to all channels check the box at the bottom of the screen under the section marked “All”. Remember to “Apply” your settings before exiting the menu.